Thirsty for a fun addition to your table decor or party favors? 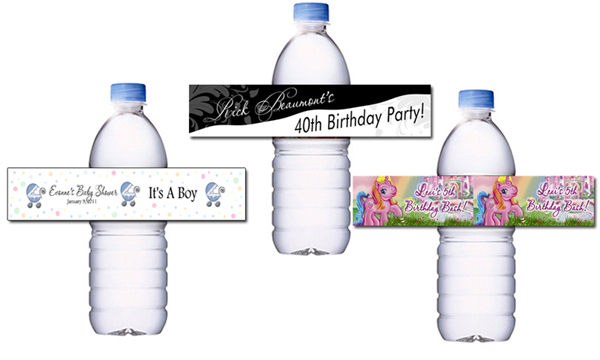 Order our custom personalized water bottle labels. Designed and created exclusively to match your theme. Each label is printed with a color laser printer and measures 1.5" high by 8.25" wide. Our labels come backed with adhesive and are ready to put over the existing label on your bottle. Please be sure to measure the existing label to be sure our dimensions will cover it. Please note that manufacturers may change their label size and it is best to verify the proper size for your water bottle. We are not responsible if you order the wrong size or it does not fit your water bottle, so please order carefully.